We are very grateful for the advice and support of John Pegg, who worked as a Telegraph Lad and Signalman in the Grantham area between 1957 and 2004, and Mick Grummitt, who was Rest Day Relief Telegraph Lad between 1959 and 1962 at Grantham North and Grantham South boxes and also at Crescent Junction, Spital Junction and Westwood Junction boxes at Peterborough. Mick also occasionally worked at Grantham Yard signal box. Can anyone help me with a question I have concerning Yard Box? I would like to know how the Loco coming off a train for engine change was signalled forward in semaphore days. I have never seen a ground disc in photos and there is not an auxiliary arm on the main post. If there is an advance starter that may answer my question. That's a very good question. I suspect there would have been a disc signal but, like you, I've never seen one in a photograph. In photos taken in the vicinity of the Yard Box there is usually a locomotive, either standing or moving off, which obscures the site where such a signal might be; or else the probable location isn't included in the picture at all. In the absence of photographic evidence, if we can find a signalling diagram for the Yard Box from before about 1954, when the starting signal was a semaphore, that would clear this up. Such a diagram recently surfaced for the Grantham North to Barkston South Junction section, but we haven't yet seen one which covers the Grantham Yard area. Information which provides the answer to questions like this has a habit of coming to light though, so we'll certainly keep your query in mind. Thank you very much for your reply to my question. I, like you, have studied many photos of the area and have found no evidence of a ground disc. A signalman friend has suggested flags may have been used. 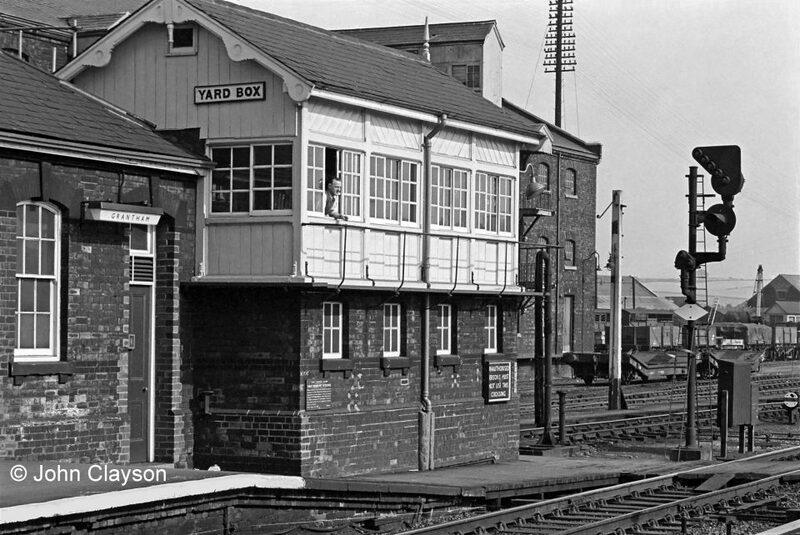 I wonder if there are any surviving signalman who worked Yard Box who may remember? I have friends watching EBay and Auction sites for me to try and spot a signalling diag for Yard Box coming up, but I suspect it would cost a fortune if it does. Also, a platform working timetable for the early '50s would be handy. If I ever get one I will make sure Return To Grantham has a copy.